A conversation with Gene Pelham, CEO of Rogue Credit Union. We have increasing demands from local consumers looking for local financial institutions to do business with. Yet as a not-for-profit cooperative, our hands are tied from not having access to capital like a for-profit financial institution that would be able to immediately respond to those increased demands for service. There is a high demand for local financial services, and our biggest challenge is making sure we can attract and build financial stability to take on that demand. Will there be continued consolidation in the sector? There is continuing disruption in the financial sector, especially in Oregon with the financial institution mergers. In southern Oregon, we have seen so many local financial institutions be merged into Seattle-based or Spokane-based banks. There are only two local financial institutions headquartered in Jackson County: us and a local bank, the People’s Bank of Commerce. Consumers are losing the choice for local financial services in their hometowns. Consolidation will not happen in the not-for-profit credit union space as rapidly because there is no incentive from a financial perspective for credit unions to join together. Dodd-Frank has added an increasing level of regulatory complexity to financial institutions, including credit unions. The local community banks and credit unions really never got involved with what the Dodd-Frank Act was set up to protect. We are being punished for something we didn’t do. In effect, it is impacting local consumers because they are paying for additional oversight and regulatory and compliance work that was really caused by money-center financial institutions. We are working around that, but we have gone from one internal auditor to a department of five people to make sure we are complying with the rules and regulations. Are you concerned credit unions may lose market share to banks as the economy recovers? Yes. I am concerned for the consumer more than anything else. We know major financial institutions have considerable financial resources. They can offer incentives to get consumers to move. What we worked hard to do is build that local value-focused relationship so that you won’t be able to buy our members from us with offers. We are providing a value that is demonstrated day to day in the communities where our members, who are also our owners, live and work. But it is a risk as large institutions go back and focus again on the consumer marketplace. The financial crisis forced folks to look again at who they trusted, which were friends, neighbors, their local community. They looked first to the local area for their financial services. We saw that as an incredible opportunity during the financial crisis to build a high level of trust with our members. We are still seeing dramatic deposit growth and membership growth and loan growth. We are in a unique market in Southern Oregon, too, because all but one local financial institution moved their headquarters away. A large number of consumers want a local institution. In most circumstances, we would have seen other financial institutions pop up as the headquarters and leadership moved out of this area to the metropolitan areas. But Dodd-Frank and increased regulations have made it much harder to start new financial institutions. Our consumer-lending portfolio, whether it is auto loans, recreational vehicle loans. What we saw in the financial crisis is consumers got very conservative; they held on to vehicles, they got rid of recreational vehicles. Now they feel comfortable enough to buy those items again. That is why we are seeing considerable growth in those areas. I was answering a member’s email at 8:30 at night about Apple Pay, and when we are going to offer Apple Pay. Because we are a smaller financial institution, we are farther down the list on being able to put that in place. We are excited about introducing what we call a new personal teller machine; it is actually an ATM. During certain hours of the day, the screen comes up with a real person, and that person will serve you as if you were at a branch. That is giving us the opportunity for our footprint to be smaller, because the cost of deploying those is less than opening a new branch in a community that is not large enough to support a branch. How will Apple Pay change the way financial transactions are conducted? The thing I like most about Apple Pay is that the device links consumers with their hometown financial institution. It is still coming out of your checking account, or accessing through your debit card or whatever. I have used the Starbucks app on my phone as long as it was out there. We are embracing that technology and understand our customers want those conveniences. But even with Apple Pay, we find our members want to talk to a real person when they are uncertain, when they are making a decision about buying their first car or getting a mortgage loan. The irony of enhanced technology and remote access is we are still seeing consumers want someone to hold their hand during the initial phases. Click through for an abridged Powerlist. Kim Moore is the editor for Oregon Business magazine. Business and government haggle over tsunami solutions before it’s too late. Business owners who transfer ownership of their companies to employees receive big tax benefits. Readers respond to the April issue's Storyteller-in-Chief column by Bob Moore of Bob's Red Mill. The 2019 100 Best Nonprofits survey is live! 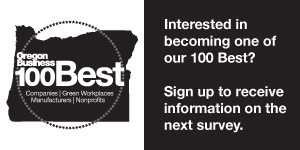 The survey for the 2019 100 Best Nonprofits to Work For in Oregon is now open! Template Design © Joomla Templates by GavickPro. All Rights Reserved.